After more than five years and much diplomatic wrangling, Palestine has joined the International Criminal Court (ICC). Now, the prospect of Israel being held accountable for war crimes has greatly increased, and that will have significant repercussions for the peace process and for Palestinian statehood. ICC prosecutor Fatou Bensouda opened a preliminary investigation on January 16. This can investigate everything that has happened in Palestinian territories since June 13 2014 – the date that Palestine formally accepted ICC jurisdiction. This is also the date when Israel broke a ceasefire with Hamas leading to Operation Protective Edge, which raged throughout the summer of 2014, leading to the deaths of at least 1,473 civilians in Gaza and bringing widespread international condemnation against Israeli actions. The story dates back to 2009, when the Palestinian Authority requested that the ICC investigate Israel over Operation Cast Lead, but was rejected for not being a state. It was rejected for full membership in the United Nations in 2011, but was granted the status of non-member observer state the following year. 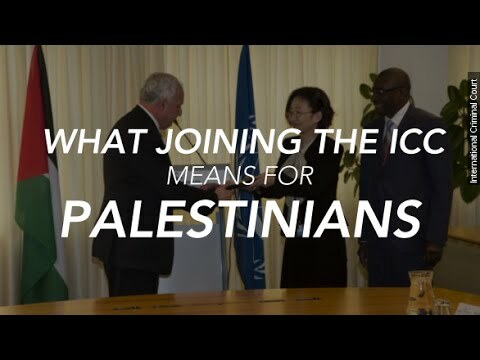 Palestine then joined numerous international organisations, such as UNESCO, and while the question of its statehood remains controversial, it has now been allowed to join the ICC. In the interim it has periodically indicated it would refer Israel to the ICC, but was held back by pressure from the US, the UK and France – and because using the threat suited Palestinian political interests. The prosecutor could investigate the civilian casualties in Operation Protective Edge. She could also investigate whether the Israelis carried out the war crime known as collective punishment. This includes demolishing the homes of suspected Hamas militants, thus rendering their families homeless, as well as killing civilians in these buildings. During Operation Protective Edge alone, Amnesty International reported that “more than 18,000 homes were destroyed or damaged beyond repair”. The prosecutor would also be likely to investigate Palestinians over the hundreds of rockets Hamas fired indiscriminately into Israel from Gaza, which resulted in the deaths of at least six civilians. Most substantially, Bensouda could look at the continued occupation of Palestinian territory, including both the West Bank and Gaza. Specifically this might look at Israel’s settlement policy, which appears to contravene Article 8 of the ICC’s founding Rome Statute. The ICC’s power in this situation is somewhat weakened by the fact that Israel is not a signatory to the ICC, but still significant. Bensouda could issue arrest warrants for individual Israelis, who could then be arrested if they travelled to one of the 123 signatory countries. Any finding would also be a powerful condemnation of Israeli policy that could severely damage the country’s international standing. A big issue would be identifying those most responsible for relevant actions against Palestinians. This could very well include Israel’s prime minister, Benjamin Netanyahu, and his predecessors – as well as other senior government officials and military commanders. In theory there are precedents that would enable Bensouda to decide not to investigate Hamas on the grounds that the actions by the Israelis were much more serious. But in practice the intense international scrutiny would likely put extra pressure on the prosecutor to be completely evenhanded. The implications of any investigation are extremely unpredictable – particularly following the recent Israeli election, where Netanyahu stated that there would be no Palestinian state while he is in power (he has since tried to move away from this statement, but few believe this reversal). One prospect is sanctions against the Palestinians. Israel has already retaliated for Palestine joining the ICC by refusing to transfer to the Palestinian Authority more than $100m (£68m) per month it collects in taxes (it has since partially backpedalled). And despite the fact that the US is not a party to the ICC either, Congress has passed a law as a concession to the pro-Israel lobby mandating that all economic assistance to the Palestinian Authority be cut off once it joins the ICC. Such sanctions could cause the Palestinian Authority to collapse, doing even more harm to the peace process. This would further destabilise an unstable situation and potentially further radicalise Palestinians, while expanding global sympathy for the nation. A second possibility is that an investigation deters Israelis and Palestinians from further armed conflict, but this is unlikely while Israel’s policy continues to be based on its oft-proclaimed right to protect its security and continues to see settlements as key to its continued existence. And legal challenges from a court which Israel doesn’t recognise are not going to change those policies overnight. Given Obama’s comments after the Israeli election there is widespread speculation that Israel may have to reckon without continuing US diplomatic cover in the UN Security Council, which might might reduce the prospect of the US attempting to get a resolution through the UN Security Council to suspend the investigation. But Hamas is unlikely to be deterred by the threat of the ICC either. The conflict goes too much to the heart of Palestine’s existence – and we have seen that Hamas is willing to endure much more severe punishment from Israel to pursue its goals. A third possibility is that the peace process revives. Many will not want it to collapse entirely, including the US – which may be prepared to reverse its opposition to a Security Council resolution calling for the occupation to end and the creation of a Palestinian state. The Obama administration has recently reiterated its public backing for a two-state solution, after all. The quid pro quo would likely be that ICC proceedings be suspended. Of course, such a move by the Obama administration would likely be resisted by both hardline Israeli politicians and many members of Congress. Russia, in particular, could also decide to veto a suspension through the Security Council at some point. Even if the Israelis did reach a peace agreement, the threat of prosecution in The Hague would always remain. Palestine joining the ICC has further complicated the situation in the region over and above the Netanyahu election victory. And even if peace broke out in lieu of an investigation, it could have negative consequences. It could make the ICC seem merely a tool to make warring parties lay down arms, which could badly damage its legitimacy. It would keep in power those who committed atrocities on both sides, raising the possibility that they could be spoilers as the peace is implemented. Meanwhile those most affected would likely be left feeling they had received no justice. Some people on both sides might only feel able to embrace reconciliation after seeing wrongdoers punished. They might rightly ask whether this is the best result that decades of development of human rights norms and mechanisms can deliver.